This week when I went to the library to gather books for this post, there were more books than I could ever imagine checking out in a week (and I check out a lot of books!) by Rosemary Wells. My daughter picked a book by Wells night after night since we brought them home, and we will probably be reading more books well after her birthday. Many of her beloved characters we enjoyed for the first time like Noisy Nora, McDuff, Edward the Unready, and Yoko. These characters along with Max and Ruby have allowed Rosemary Wells to write and illustrate children's books for over 40 years. The book that caught our eye this week was Yoko's Paper Cranes about the young cat, Yoko and her grandparents. Her grandmother, Obaasan, would take young Yoko to her garden to feed the cranes. The cranes would stay for a few months then fly away from Japan only to return the next year. Yoko's grandfather, Ojiisan, also had something to share with young Yoko as he taught her to fold paper cranes. When Yoko gets a bit older she moves to America with her mama and papa. Yoko and her grandparents keep in frequent contact. As winter approaches, Yoko gets nervous that she doesn't have any money to buy Obaasan a birthday present. Then she thinks of the perfect present - paper cranes! Rosemary Wells ties the whole story together with a very heartwarming ending. 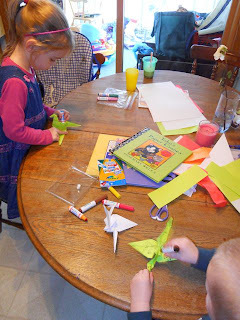 My daughter asked if we could make paper cranes to celebrate the birthday of Rosemary Wells. I told her it was a great idea, but that I had to tell her a story about my experience making paper cranes. I was teaching fourth grade and it was the week after the September 11, 2001 and we were looking for a positive activity to do with all the fourth graders. I had the idea to fold peace cranes and tell the story of Sadako Sasaki. I practiced the folds over and over until I was able to do it without thought. I was confident and ready for 80 fourth graders to make peace cranes in a 45 minute block of time. However, it didn't work out that way! It was a complete disaster. There just weren't enough adult hands and eyes to keep everyone on track. I was running around the tables in the cafeteria helping one child after another. Then, other teachers were looking at me for help! Arrrgghhh...We sent home copies of the directions along with the unfinished crane. Oh well! The paper crane activity was much more pleasant with my own children. I refreshed my skills by looking at the handout and another site that guides you through your folds. We decorated our cranes with markers when the folds were complete. After everything was over we ended up folding paper airplanes too! 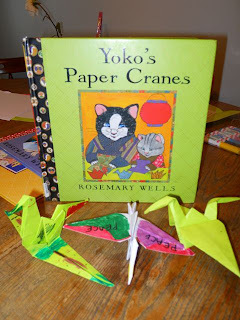 If my daughter hadn't come up with the paper crane idea we were going to prepare for my daughter's 100th Day of Kindergarten with the book by Rosemary Wells, Emily's First 100 Days of School . She has the assignment for school to find 100 of "something" to take to school. I found a video of this book on SchoolTube. This is a 36 minute video that goes through every number from 1-100! There are many valuable resources available on Rosemarywells.com and other sites on the internet. Please check the links below and I am sure you will find a great activity for your celebration. Rosemary Wells is a fabulous author! Max, the bunny, is one of my all-time favorite characters. He definitely captures the essence of boyhood!